I teach a monthly cooking class in St. Helena’s School Cafeteria. Parishioners of St. Helena’s can sign up at the rectory and pre-pay for grocery shopping. The general public can sign up through Meetup, here: Starling Avenue Triangle Plant-Based Lifestyle. 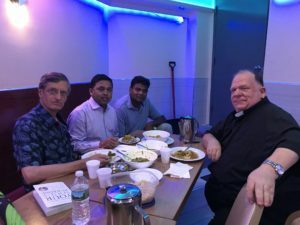 Typically on the 4th Tuesday of the month, we have a monthly dinner at Neerob Restaurant on Starling Avenue. You can RSVP online via Eventbrite, by searching for Neerob. 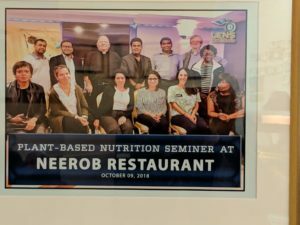 In 2018, we held our first “Dinner for Doctors” at Neerob Restaurant. In 2019 we are planning another one for March 21st. The dinner is primarily for local area doctors and their staff, but open to the general public. Tickets area available on Eventbrite under Neerob. My activities in the area of the plant-based lifestyle are all anchored in my role as Group Leader for the Bronx for Plant Pure Communities (PPC), though some of them pre-dated my association with that group. The bottom line for me is that the whole foods, plant-based nutrition paradigm is the buoy to which all of Lifestyle Medicine is anchored. Plant Pure Communities is a global not for profit that support people in making the transition to the plant-based lifestyle. One of the most important activities of PPC is the Jumpstart program, which is a 10-day full immersion program in the whole foods, plant-based diet, for 36 Medicaid patients at a time. These programs show people that they can feel better than they have in years, and the progress even within the 10-day period is greater than anything that could be achieved with pills and procedures. For many patients this becomes a pathway to reversing many serious conditions and within 3-6 months many can become largely or wholly drug-free. Typical results based on the labs before and after are 5lb average weight loss, and 20% drops in blood pressure and cholesterol. Typically, if patients maintain the program, they can achieve Cholesterol below 150, which Dr. Caldwell Esselstyn considers “heart-attack proof.” Many can start reducing or coming off insulin and statins and a number of other medications. The prototype for the program was documented in the movie PlantPure Nation, and presently a national campaign is in progress under the name Healing America Together, which has delivered a powerful push for the program. Our PlantPure Pod for the Bronx has a group on Facebook group called Plant-based DaBronx. I also maintain a local area blog, focused on resources for the plant-based lifestyle in our neighborhood, which I call the Starling Avenue Triangle, since we have a triangle of three major supermarkets, Chang-li, Key foods, and Pioneer, and through the middle of it runs Starling Avenue which has a plethora of Bangladeshi food stores, and restaurants, including Neerob, where our activities in the neighborhood are centered. My Local Plant-based Blog: Starling Avenue Plant-Based Living.